From the long maintenance intervals, which are now taken for granted in many modern vehicles, motorists could only dream of in the past. In the early days of automobile construction, it was said that after about every 600 miles the vehicle needs: changing oil and, a thorough inspection of tyres, engine and important parts. Because for example, the shock absorbers were exposed to the bad roads of the time of and due to the weight of the vehicle itself, also to an extremely high load. Since then, so much has changed for the better, not just in terms of infrastructure adapted to mobility on four wheels. The vehicles have also become ever more perfect and reliable. The reason: better-structured manufacturing processes, the use of innovative materials for the body, the use of electronic high-tech elements for engine management. One thing, however, even technical progress can't change: a car will always need maintenance to stay operational and roadworthy. And even with the new generation of electric vehicles, car repairs due to wear, accident or technical imperfections will be part of everyday life for road users. The increasingly complex technology of modern vehicles also has an impact on car repair. The image of a mechanic with an oil-stained overall lying under the vehicle, handling a screwdriver, is no longer the image of the car mechanic of our time. Meanwhile, it needs real specialists in the car workshop to take care of the vehicles. 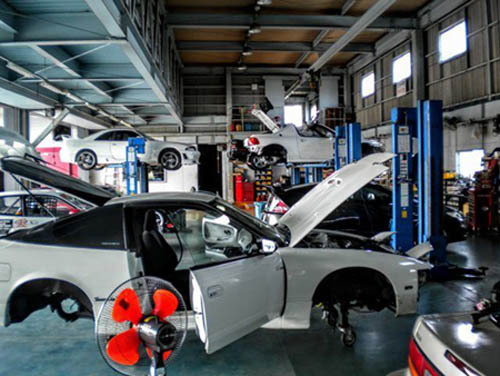 Whether you are an auto-mechatronics engineer or a fully trained car mechanic, car repairers in the workshop require the expertise of experts who are as familiar with computer technology and electronic components. The trend will continue: Car repair will require more and more specialist knowledge. We at Bourne Car & Van Hire have been following this trend for quite some time now by attending regular training classes to stay up to date with the latest technology - and also by purchasing the latest diagnostics equipment and tools. This way, we are able to look after all types of vehicles no matter how old or new. There are almost no limits in what we can do to repair any part of any vehicle. After repairing axles, shock absorbers, handlebars or tyres, our team of technicians often uses a tyre service including balancing and wheel alignment to ensure that the wheels roll properly again after the car repair and the driver is safely back on the road. However, when it comes to the bodywork, further specialist knowledge and a different technical equipment of the workshop are necessary. When it comes to minor car repairs to the body and paint or in the interior of the vehicle, we can offer a wide range of solutions. For smaller repairs, we are able to offer the so-called Smart Repair to our customers. Without replacing parts, the less complex type of car repair can quickly and cheaply eliminate small bumps and damage in the paint or on the surfaces of the fittings. In particular, when selling a vehicle, the Smart Repair often makes sense: in this way, a rejuvenated car looks attractive, and the seller can achieve a better price for his used car. So, whatever repair needs doing on your car, whether it's the engine, exhaust, body or something else, we at Bourne Car & Van Hire can help - fast and efficient. Please get in touch with us. You will tell us about the issues in your vehicle, and we will offer you different solutions and fair estimates.